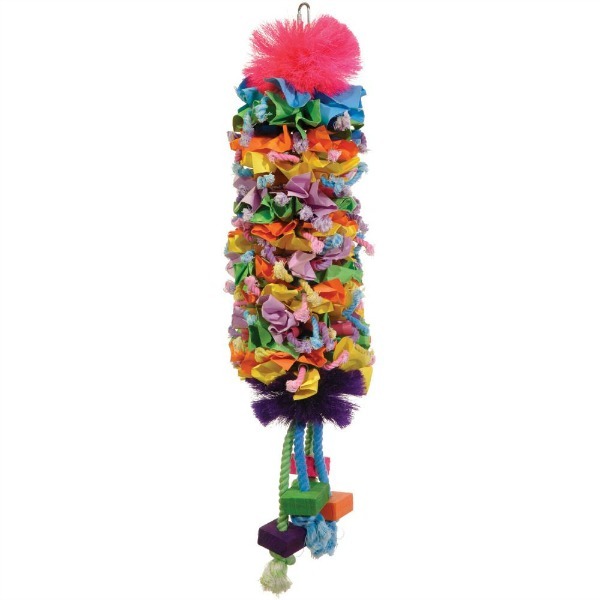 Rope toys interest every species of bird and are available in sizes that are perfect for any species from small to large. 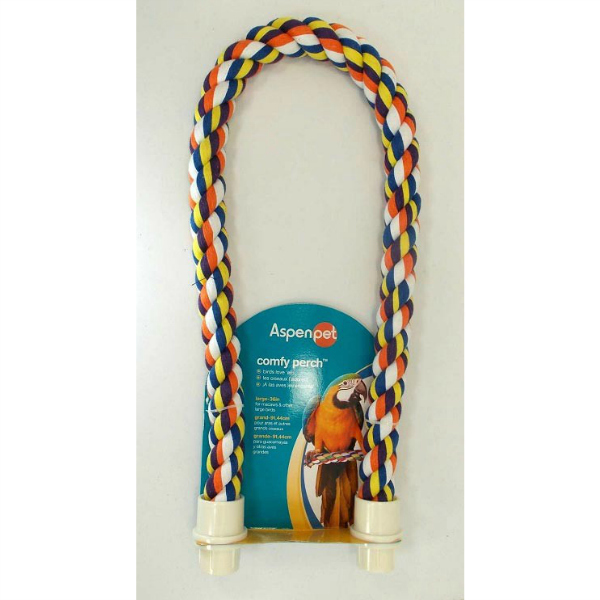 Rope toys provide climbing and foot-comfy perching options as well as play toys. 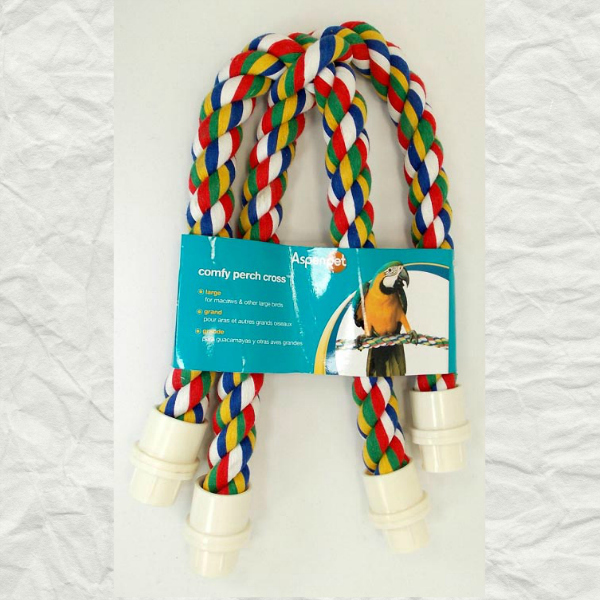 Rope perches Bungee Swings are formed into coils that have bounciness and give your parrot lots of climbing opportunities. 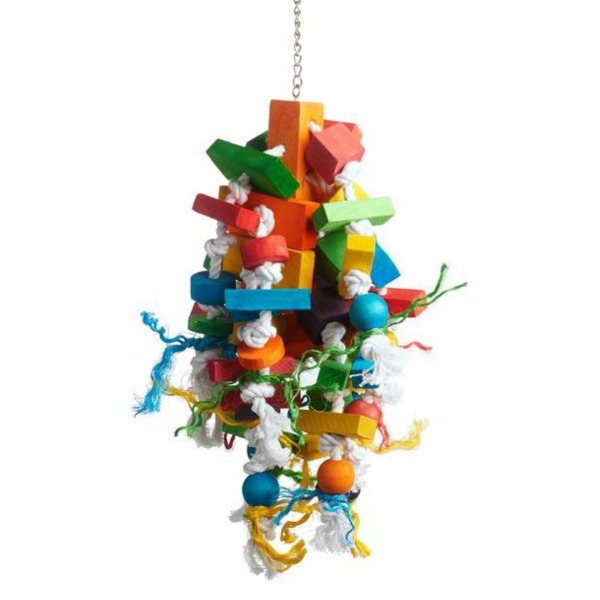 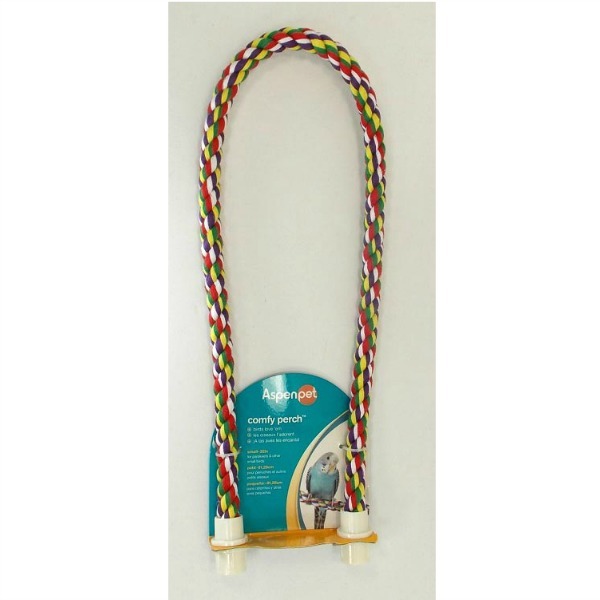 The soft multi-colored braided rope has a center structure that causes the toy to maintain its shape forever. 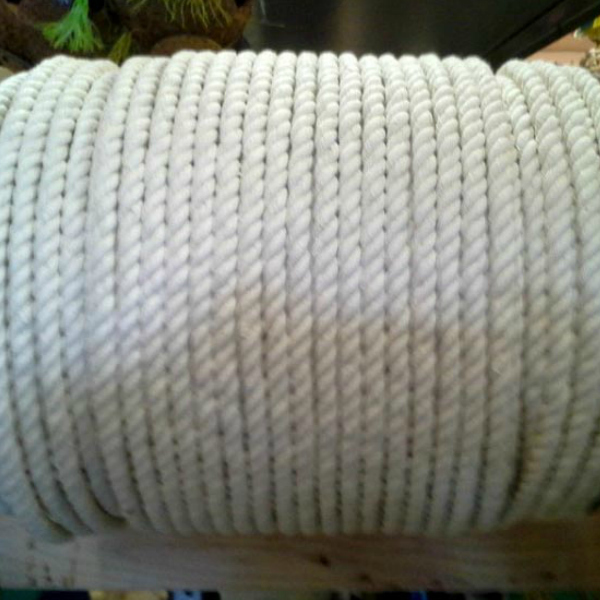 These types of rope perches can be ordered in long lengths or shorter sizes and a variety of diameters. 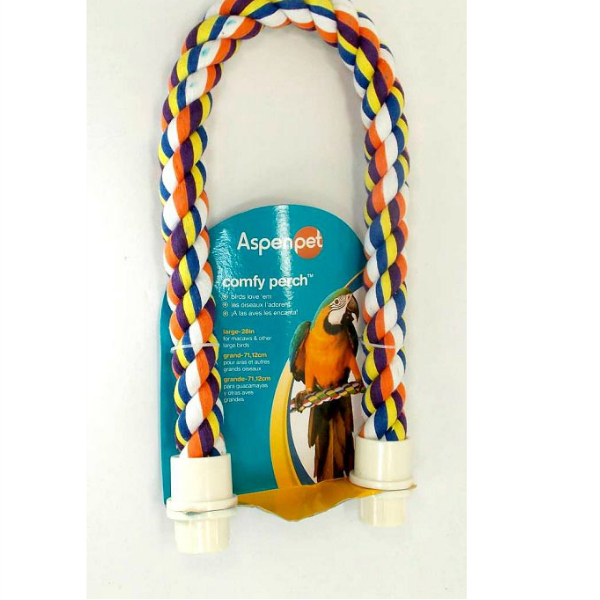 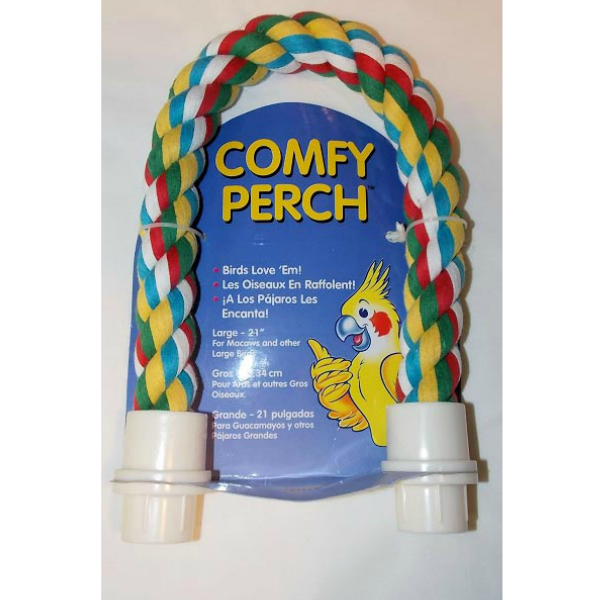 Comfy perches rope perch toys are bendable, shape-able perches that can be ordered in a variety of lengths in species appropriate diameters. 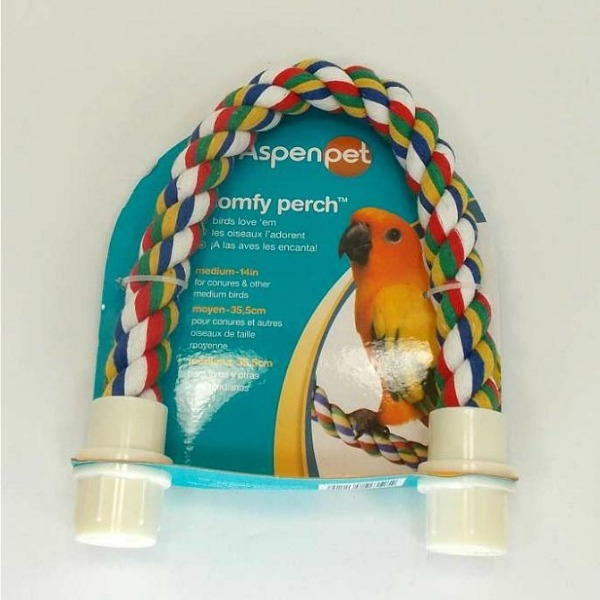 These perches are great for sleeping perches or creating various perch shapes or bridges from area to area inside the cage. 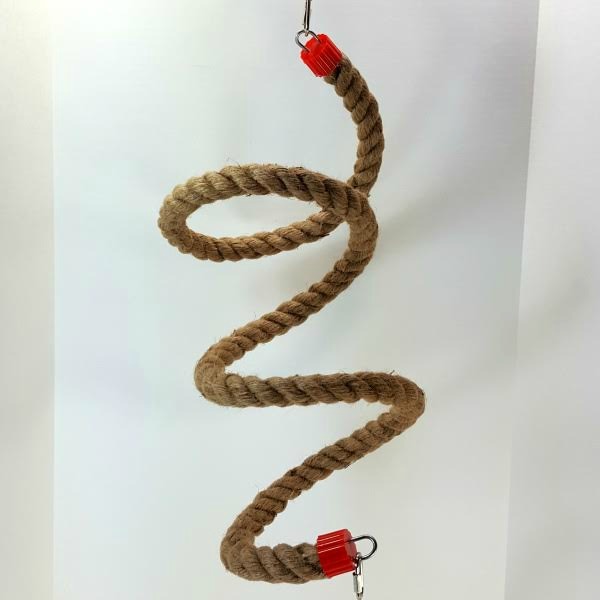 The secure end attachments can be manipulated so that one end fits the bars in one direction while the other end can attach to the bars going in the opposite direction. 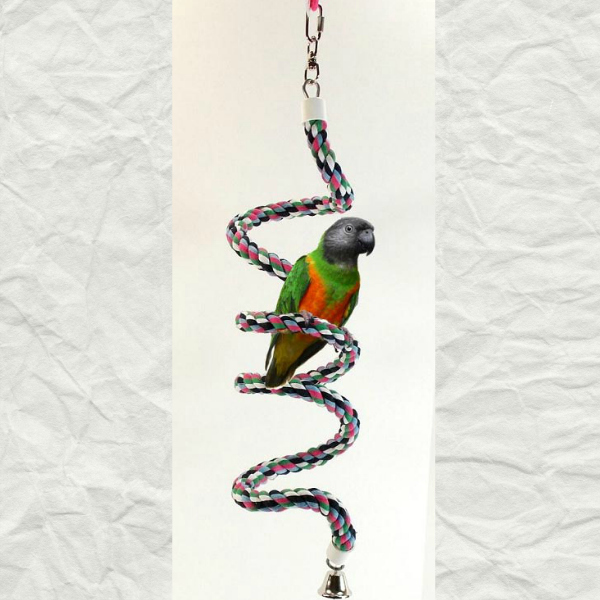 Parrots need a variety of types and textures of perches to keep their feet healthy. 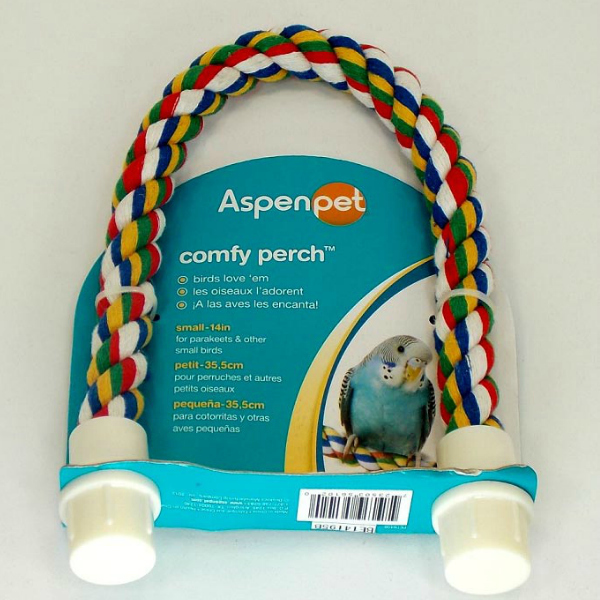 After all, birds are on their feet all their lives, only getting to rest one foot at a time during sleep. 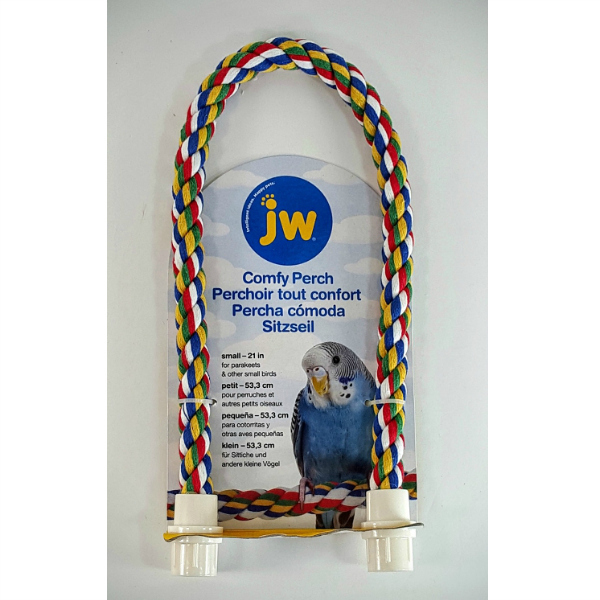 Soft perches offer a pleasant break from wood, plastic or mineral / concrete perches. 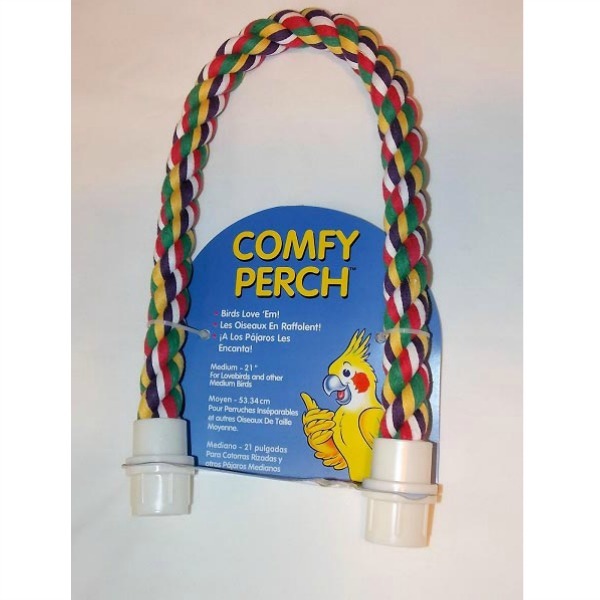 Every bird should have some of each type of perch and have slightly varying sizes while remaining within the size range for that species. 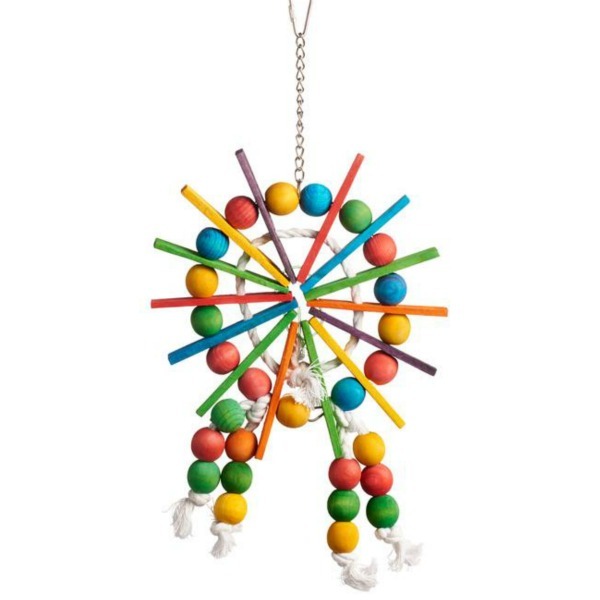 Metal circular swings wrapped with rope are another great toy choice. 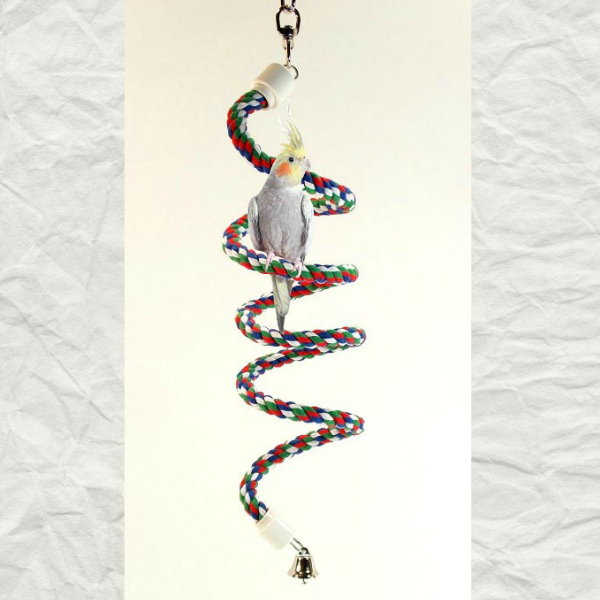 The bird can perch, swing and chew on the rope, getting lots of fun variety from one toy. 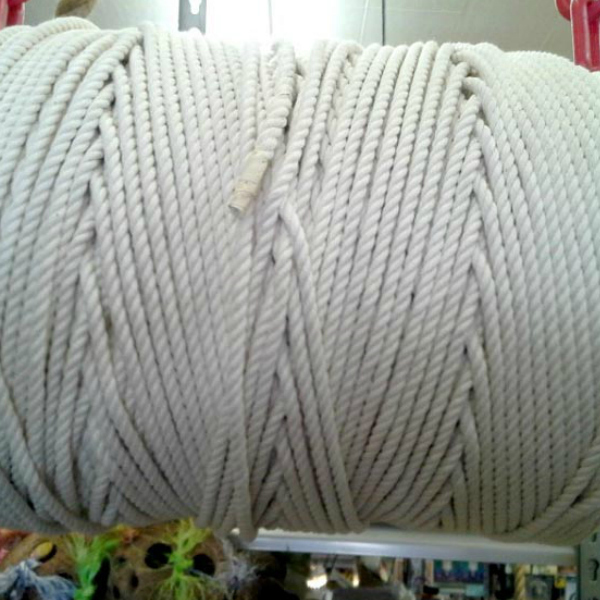 Some rope swings have multiple circles creating a globe-like appearance. 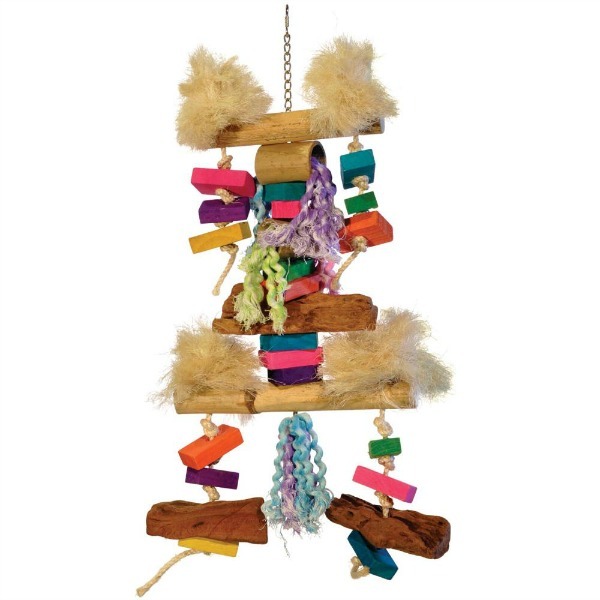 Other rope swings and toys have strings of colorful rope attached for preening and chewing. 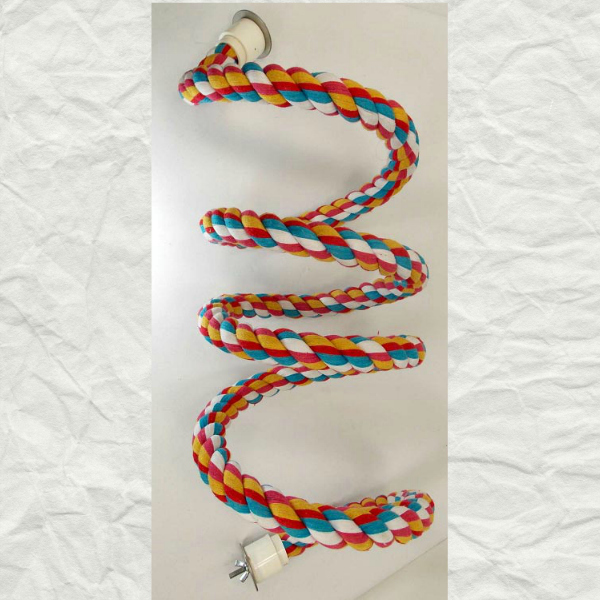 Another type of rope toys are made of rope embellished with sisal fibers, wooden bars, colorful beads and other items to add interest. 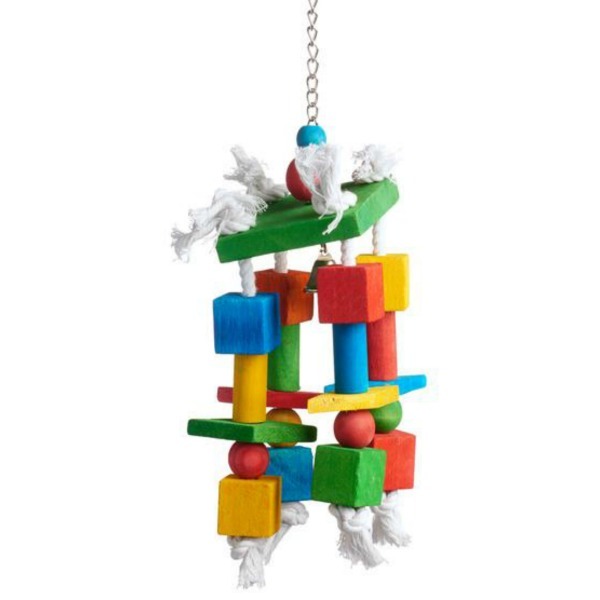 If you love to make your own bird toys from bird-safe parts you recycle from used up toys or order from Windy City Parrot, you'll find safe cotton rope in a range of diameters that can be ordered in various lengths or even by the roll. 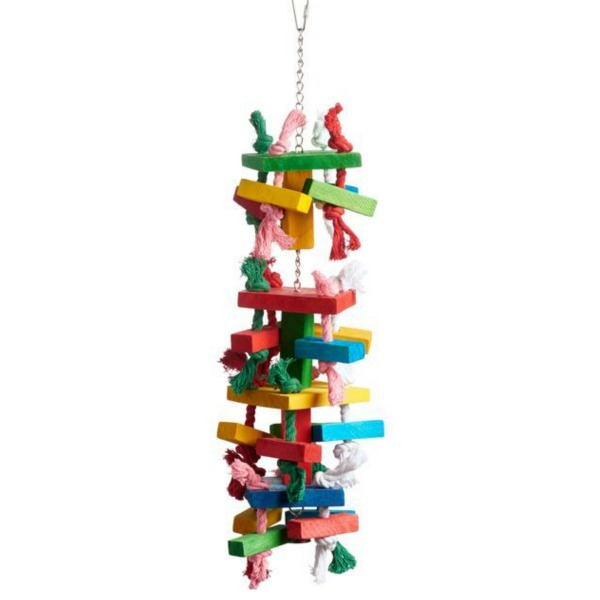 All the rope toys sold by Windy City are safe for your parrots. 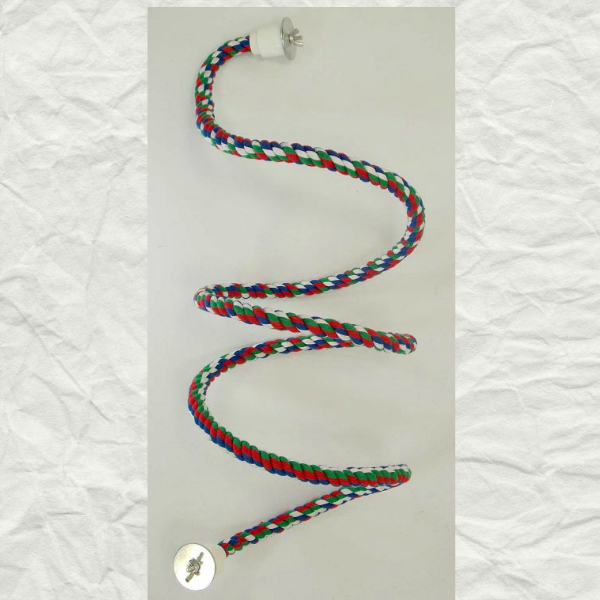 However, after long use it is possible your bird can shred some of the rope to the point of posing a potential trap for the bird's head, wing, foot or toe. 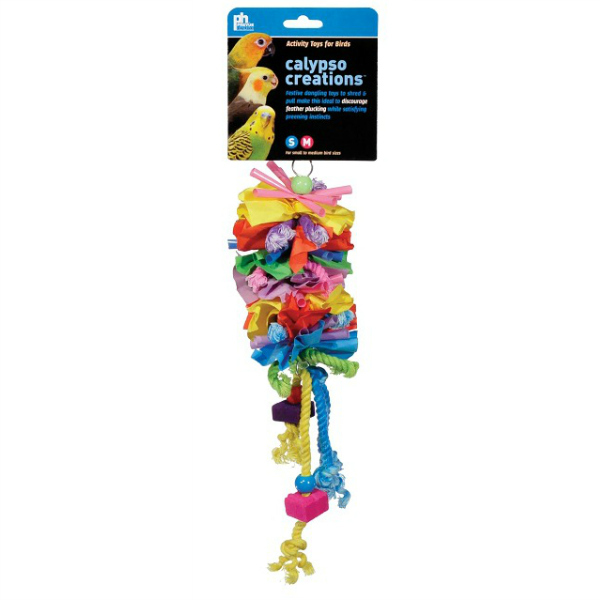 Minor spots that have raveled can be cut away with scissors and the toy returned to use. 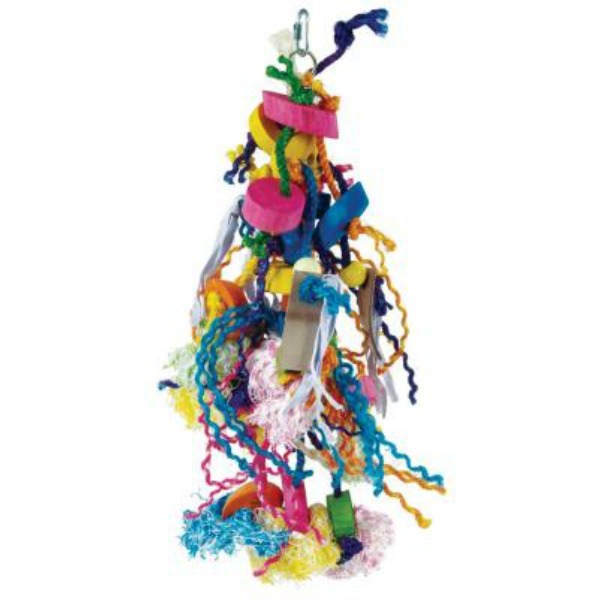 Once the shredding becomes severe, it is time to order rope and recycle the pieces or discard the toy in favor of a fun new rope toy. 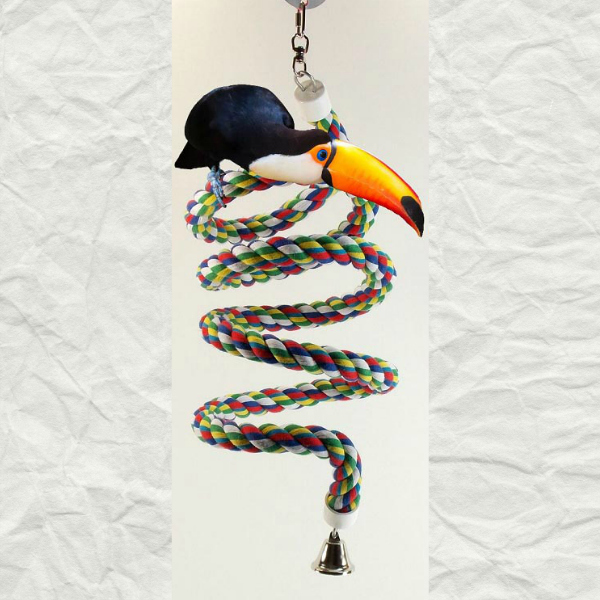 The rope perches last a very long time unless you have an unusually energetic chewer but rope that is intended to be chewed on and beaked, while durable, will need to be watched for potential traps or danger. 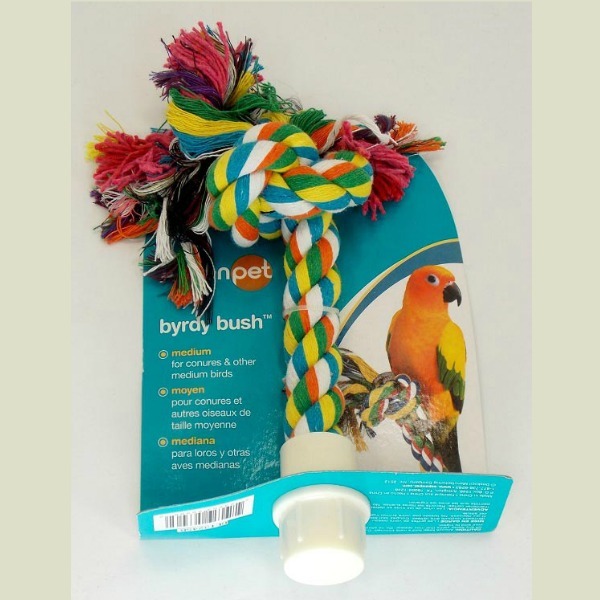 Do not let this deprive your bird of rope toys because they truly enjoy them. 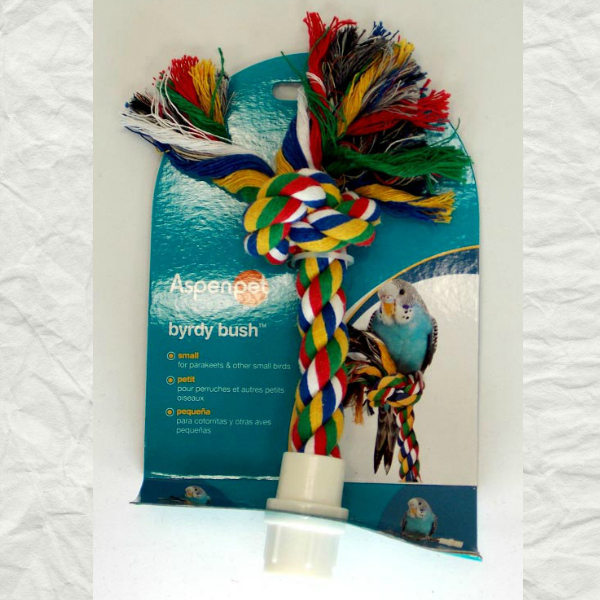 One budgie we know lots to use one of his knotted rope toys to scratch off the mature feather sheaths on his head when molting. 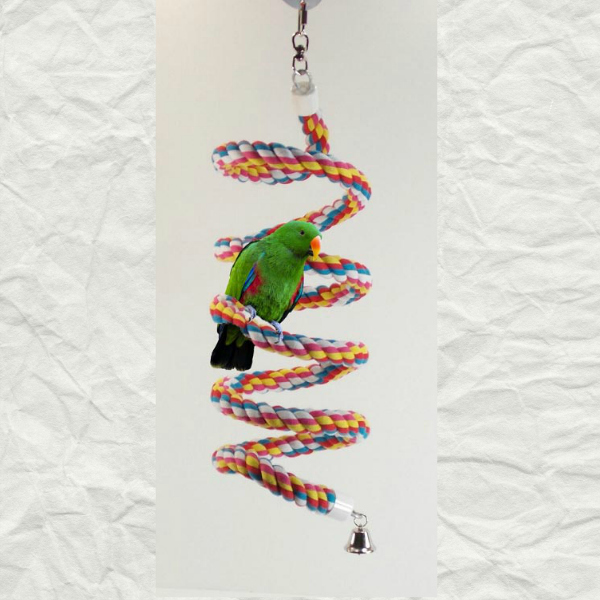 Some conures and cockatoos, known for being cuddle birds, love to have a rope toy hanging on their nap perch so they can grab a rope strand and pull it under a wing for security much like a child with a teddy bear. 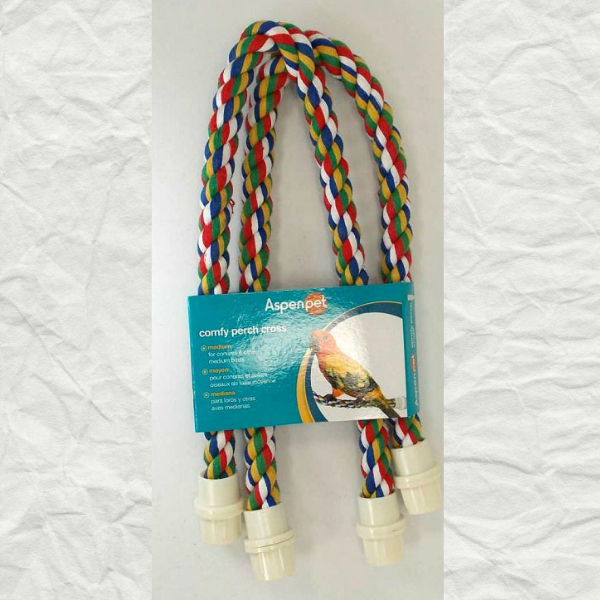 Many puzzle-loving birds like to work and work until they manage to untie a knot or two. 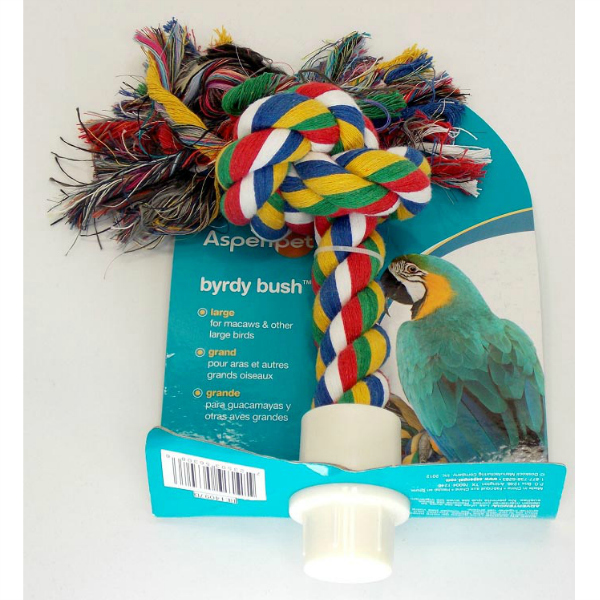 Simply retie the knot and let the bird have another go at the toy. 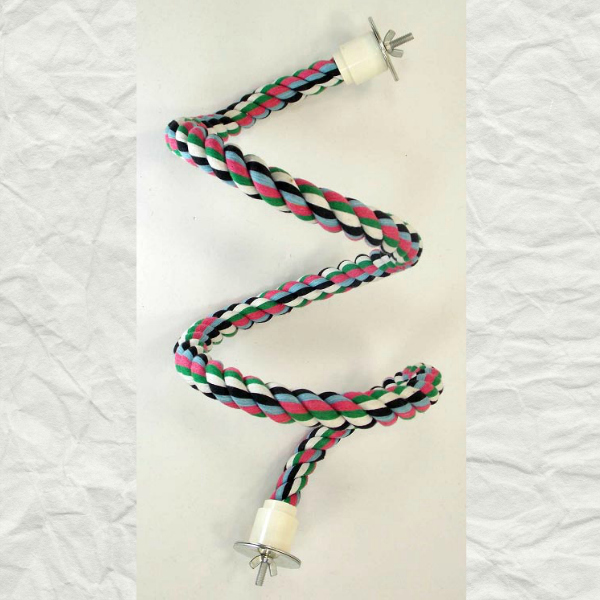 The more knots, the more fun for the bird. 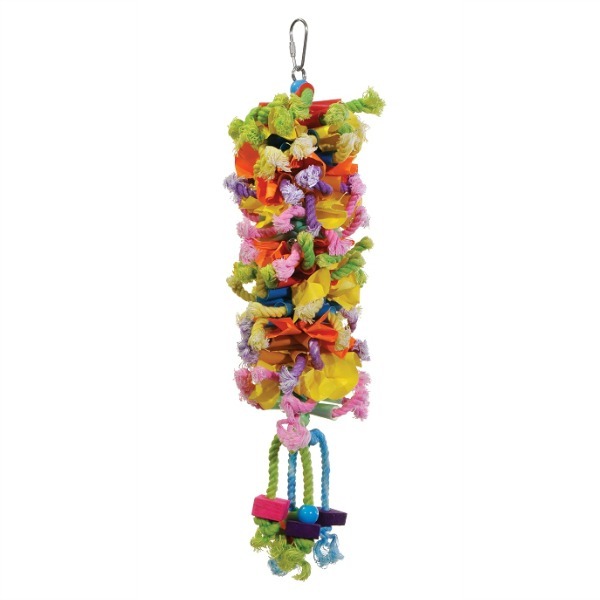 Enrich your birdÃ¢â‚¬â„¢s life with a selection of rope toys. 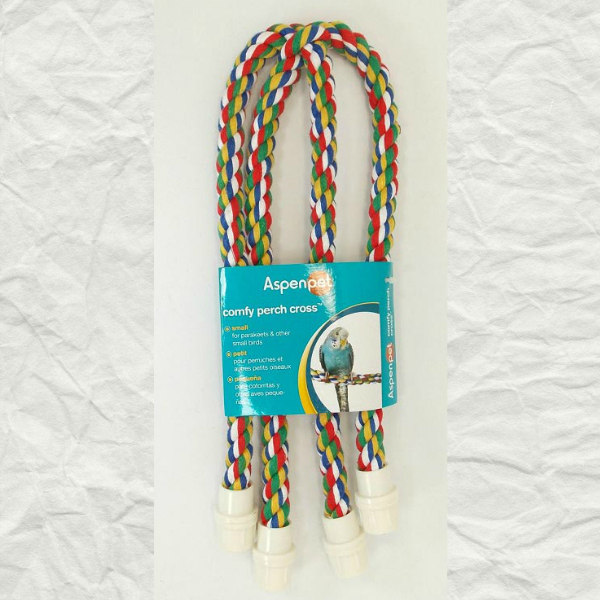 Frequently wash the rope toys, some are even machine washable and allow them to fully dry before giving them back to the bird. 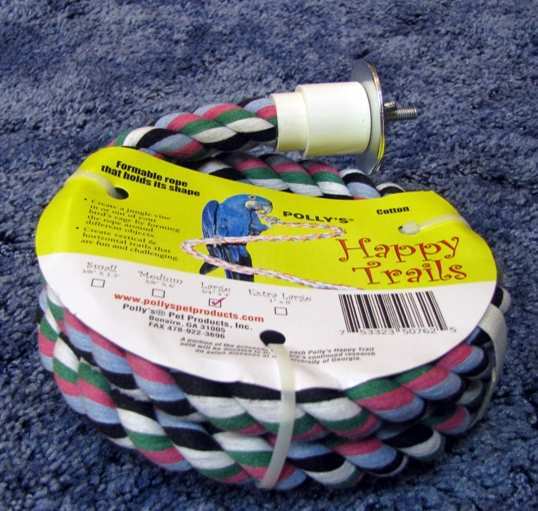 Damp rope perches can cause arthritic feet and toes.